India’s three free trade agreements with the ASEAN, Japan and South Korea have not turned out to be favourable for the country as these resulted in growing deficits in merchandise trade, according to a study published by think-tank Third World Network. “When the analysis of the three existing Comprehensive Economic Partnership Agreements (CEPA) show that the balance sheet is heavily loaded against India, there is no reason to hope that the Regional Comprehensive Economic Partnership (RCEP), which includes 16 countries, will be any different for the country,” said Biswajit Dhar, author of the report titled ‘India’s CEPAs with ASEAN, Japan and Korea’, at a discussion on Tuesday. The study is important as the government is at present focussed on how to make India’s free trade agreements deliver more for all stakeholders and has also employed three think-tanks to analyse the on-going RCEP negotiations. 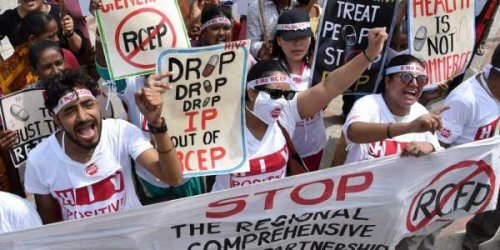 India is especially anxious about RCEP as China, which is one of the bloc partners, holds the threat of flooding the domestic market with cheap Chinese goods. Over the past decade, India’s trade imbalance vis-à-vis its existing CEPA partners has steadily increased, the study observed. After the initial spurt in the middle of the previous decade, trade imbalances saw a sizeable increase immediately after the three CEPAs with the ASEAN, Japan and Korea came into effect. Trade deficit with the three countries, which stood at $4.5 billion in 2004 and $16.4 billion in 2010, shot up to $29.7 billion in 2015 before cooling down a bit to $26.6 billion in 2016. “What is of additional concern is the fact that India’s exports have lagged behind at a time when its CEPA partners have been providing additional market access,” Dhar said. The three CEPAs not only resulted in rising imports but also a progressive slowdown of exports. “These trends provide a clear indication that while India’s FTA/CEPA partners were well positioned to taken advantage of an open Indian economy, Indian entities have been unable to exploit the market access opportunities offered by the partner countries,” the study said. Available trends in both exports and imports point to a hollowing out of the manufacturing base, which has prompted the present government to initiate measures for the revival of the manufacturing sector, the report added. The Society of Indian Automobile Manufacturers (SIAM), in its white paper on India’s FTAs, has stated that the negative fallout of the pacts will seriously compromise investments, manufacturing value add and employment at no obvious gain in trade or economic expansion. While the study could not throw much light on services trade in the absence of comparable bilateral data, it observed that none of the pacts resulted in significant liberalisation in the movement of skilled professionals.